Tell that to the people who have been injured by these villains. A reader told me about the third-degree burns she received from handling one. At least one boy had to have skin grafts after exposure. Temporary or even permanent blindness is possible. 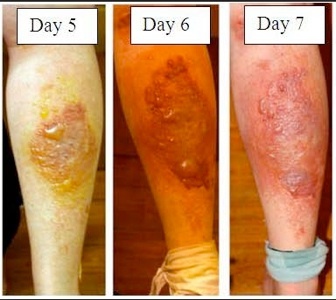 And blistering reoccurs the next time the initially infected area is exposed to the sun – often for years. This is, quite simply, a very dangerous plant. 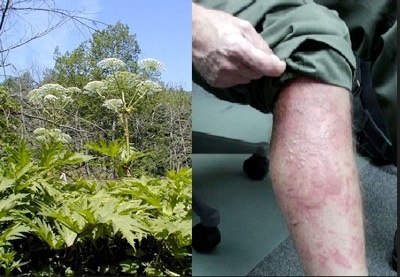 Most people consider it a far more serious problem wildflower than poison ivy. Your best bet for removal is to call the DEC. If you take on this project yourself, be alert to the following: Do not touch the plant with bare skin. Wear long, waterproof gloves, long sleeves, pants, boots and eye protection; synthetic water-resistant materials are best since cotton and linen fibers can soak up the plant sap and be penetrated by plant hairs. Do not touch your bare skin with sap-covered gloves. If you are working with others, keep a good distance from one another as the sap can splash 3 to 4 feet. Apply sun block before beginning to work. Launder clothes that may have contacted plants and wash equipment with water immediately after use. If possible, limit work to overcast days or after sunset. Don’t use weed-whackers or brush cutters, because the sap may splatter when stems are cut. Have water, soap and eye-wash near your work area in case of exposure. And if you are exposed: Wash with soap and cold water as soon as possible. Keep any exposed areas away from sunlight for at least two days. If a reaction occurs, apply topical steroids to reduce the severity of the reaction and ease discomfort. If any of the sap gets in your eyes, rinse with water and wear sunglasses. Remember the long-term effects of this exposure: protect those skin areas from the sun for years with cover or sun block. And see a physician if you have reactions or questions. This relative of cow-parsnip, angelica, carrot and celery is native to the Caucasus region of Central Asia. 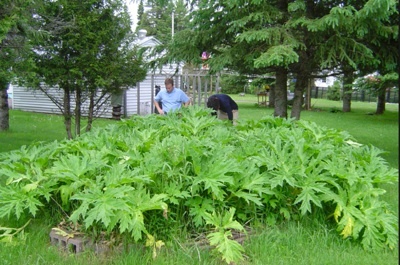 Ann Hacker called my attention recently to a patch of giant hogweed near a fishing area on Twelve Mile Creek in Wilson. She has reported this discovery to the Department of Environmental Conservation’s Hogweed Hotline (845-256-3111) but she also suggested that I warn readers about these plants, which will remain until a DEC team removes them. I am glad to do so and offer here a more general warning about this plant. Why all the fuss? This is just another garden escapee with physical characteristics that make it quite interesting. The giant in its name is accurate, for it is truly a monster among wildflowers. Full-grown plants can rise to 15 to 20 feet and their umbrella-like flowers can be more than 2 feet in diameter. 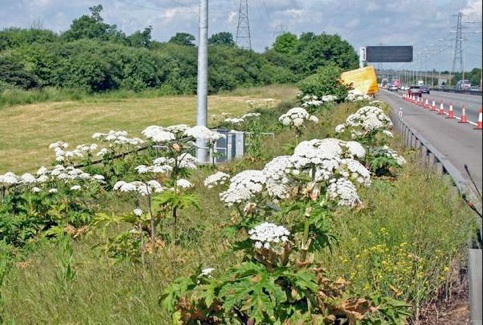 They look like Queen Anne’s lace on steroids. Doesn’t that describe a plant worth having around? 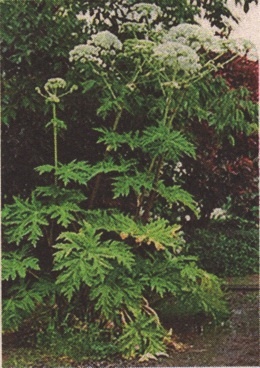 Giant Hogweed along a road. Common in damp roadside ditches. 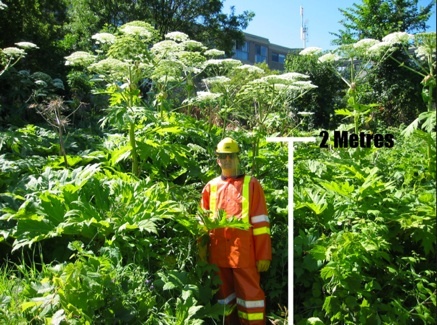 Giant Hogweed can grow in excess of 10 feet. Leaves can grow to 5 feet across. Strange plant Growing in the garden. It grows very quickly. Contact the NYS DEC if you see it growing anywhere. The stalk and flowers resembles Queen Anne’s Lace. Brushing against the bristles can cause a severe reaction. You must use heavy gloves if touching it. Exposure to the sun activates the toxin. Even after the chemical burn blisters heal, exposure to the sun will reactivate the chemical and cause the blisters to return. These reactions can occur for up to 7 years after the original encounter.